Mmmm, sweet pineapple and refreshing mint! You may not think these two flavors would go together, but they combine to form a delicious drink that will quench your thirst like nothing else on a hot summer day. 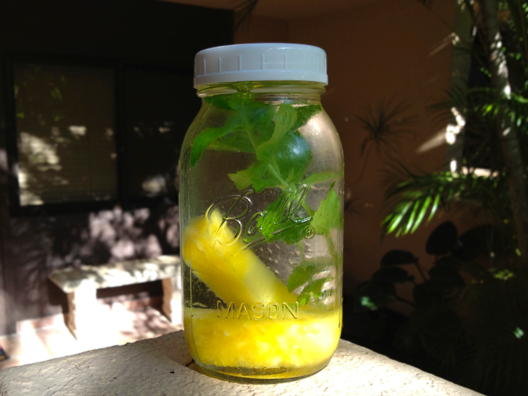 A couple tricks: it’s best to infuse pineapple for 8-12 hours. Unlike melons that release their juices quickly, pineapple needs more time to infuse. Also, be sure to tear or crush the mint leaves to release their natural oils. Recipe for a 32 ounceBall jar (pictured with plastic lid): 2 pineapple spears (approximately 1” x 4”) + 1 sprig (6-8 leaves) of mint. Infuse in the refrigerator for 8 hours or overnight. Strain before serving and enjoy! Thanks for the tip on leaving the pineapple to infuse a little longer! I LOVE your blog! Thanks so much for all of this great information! So far, this pineapple-mint water is my favorite. I would also recommend adding ginger to this recipe. If you drink it early, you get a strong ginger-mint flavor with hints of pineapple sweetness. Then, once the pineapple is fully infused, the ginger lingers in the background while still offering a little added zip. The addition of ginger sounds lovely. Did you simply peel a big piece of ginger to drop in or did you chop it into little coins sized pieces? Thank you so much for the added twist. I will be making this recipe soon. i think cutting the ginger in pieces is a better option. well you strain the juice so that you can get clear juice without particles. Hello, great site. Is there a link on your website where we can do and print out all your infused water recipes? That would be wonderful. That way. I can mix them up a bit when I want something new!